The new regulation—which would have limited the sale of sugary beverages including nondiet sodas, fruit drinks, sweetened teas and other high-calorie drinks to just 16 ounces—was championed by Mayor Michael Bloomberg, who said Tuesday that the city would immediately appeal the verdict. Bloomberg saw the ban as a way to fight the city's growing obesity epidemic. But the American Beverage Association and other business groups representing bars, restaurants and bodegas had sued to stop the new law, arguing, in part, that it would create an uneven playing field for businesses. The law would have been enforced only on establishments regulated by the city's Health Department, while stores like 7-Eleven, which is regulated as a market by the state of New York, would have been exempt. In his ruling, New York Supreme Court Justice Milton Tingling agreed with that argument, calling the new regulation "fraught with arbitrary and capricious consequences. "The simple reading of the rule leads to the earlier acknowledged uneven enforcement even within a particular city block, much less the city as a whole," Tingling continued. "The loopholes in this rule effectively defeat the stated purpose of the rule." At a news conference, Bloomberg called the judge's ruling "clearly in error." He likened the city's fight against obesity by curbing "empty calories to past regulatory hurdles, including the effort to ban lead paint and the fight to save Grand Central station from demolition in the 1970s. "We have a responsibility as human beings to do something, to save each other, to save the lives of ourselves, our families, our friends and all of the rest of the people that live on God’s planet. And so while other people will wring their hands over the problem of sugary drinks, in New York City, we’re doing something about it," Bloomberg declared. "We believe it is reasonable and responsible to draw a line. ... As a matter of fact, it would be irresponsible not to try to do everything we can to save lives." In his ruling, Tingling also criticized Bloomberg's decision to implement the ban without a vote of the New York City Council. The regulation was passed into law by a decree issued last September by the city's Health Department. Bloomberg's office had defended the regulation and its passage by arguing that the mayor has a broad mandate to protect and improve the health of New York City residents. But Tingling was skeptical of that defense, writing that "interpretation" of the law would give the mayor and the city's Health Department the "authority to define, create, mandate and enforce (laws) limited only by its imagination." The regulation, the justice wrote, "would create an administrative Leviathan and violate the separation of powers doctrine. ... It would eviscerate it." Tingling added: "Such an evisceration has the potential to be more troubling than sugar-sweetened beverages." But Matthew Greller, the chief lobbyist of the New York City chapter of the National Association of Theater Owners, which had sued to block the ban, said his group was "elated." "You can't force people to do things, and that's what today's decision shows. You can't tell people what to drink and where to drink it," Greller said. As the city prepared to enforce the so-called soda ban, many bars and restaurants complained that city officials had not fully explained how the regulation would be enforced and what drinks were and were not allowed. Meanwhile, some businesses, including the coffee giant Starbucks, said they would not comply because of the pending lawsuit and their belief that most of their products were exempt. But the ban wasn't unpopular just with businesses. A recent Quinnipiac University poll found that 51 percent of New York City residents polled were opposed to the new regulation. Chris Gindlesperger, a spokesman for the American Beverage Association, called the judge's ruling a "sigh of relief." "With this ruling behind us, we look forward to collaborating with city leaders on solutions that will have a meaningful and lasting impact on the people of New York City," he said. The ruling comes after Bloomberg had successfully championed other controversial health initiatives in the city, including a ban on smoking in bars, restaurants and public parks, and a regulation requiring fast food restaurants to post the fat and calorie content of the meals they serve. Last month, he unveiled a plan to ban plastic-foam packaging used for coffee cups and food containers—a proposal that has been popular with New York voters. 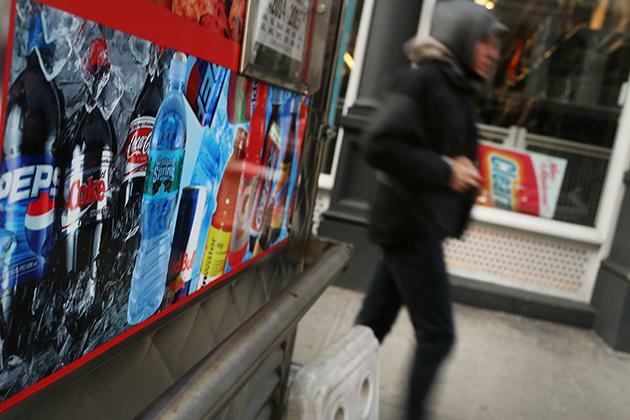 But the public never warmed to Bloomberg's soda plan, which he introduced last summer. On Tuesday, the mayor had planned to hold a news conference touting the regulation as a step forward in the city's push to combat obesity, especially among children. But his policy push was halted less than 12 hours before the city was to begin enforcing the regulation. At a news conference, Bloomberg became annoyed when asked how he had felt about the ruling after spending so much political capital on the issue. He interrupted the reporter mid-question to reject the premise of the inquiry. "My job is to do the best I can for New Yorkers," Bloomberg insisted. "That includes advising them when science says something that they are doing could be harmful. ... This is not a political capital thing. This is just one human being to another. This is what we have to do."